The Mail on Sunday returns today to the story the Irish Times and Irish Independent don't want to touch with a forty-foot pole. It is ironic that an Irish edition of a Conservative English newspaper shows more gumption in exposing this scandal than Irish owned newspapers. See also: http://www.indymedia.ie/article/80012 - for previous Mail coverage of this story and how the Times and Indo have effectively ignored it. Who are these newspapers protecting? The Fine Gael-Labour coalition of 1973-77, who ran scared from the bombs and instituted a reign of repression and terror against republicans and the (minority) of socialists who stood up to them, that's who. It was the era of Conor (‘UK Unionist’) Cruise O'Brien, Paddy ('cockroach') Cooney, Paddy ('Thundering disgrace') Donnegan and Liam ('tin pot') Cosgrave. It was the era of the ‘Heavy Gang’ in the Gardai, of censorship in RTE, of a President - Commander in Chief of the Army - forced to resign after Donnegan referred to him as a “Thundering Disgrace” in front of army officers. The two most reactionary ministers, Cooney and O’Brien, lost their seats in the 1977 general election. O’brien was infamous after 1974 for arguing that no one should say anything that might anger loyalists, in case they might bomb Dublin again. 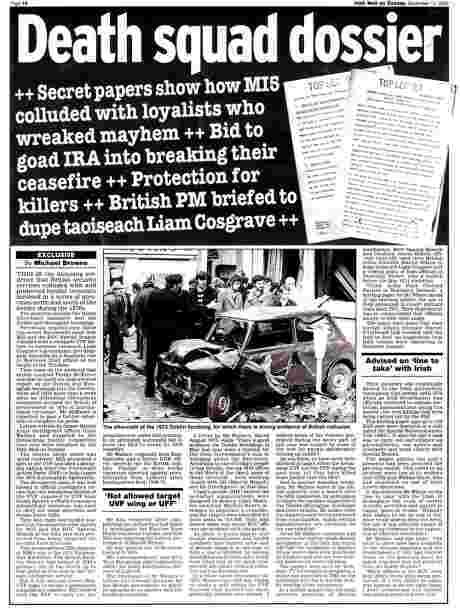 MI5 had the unionist appeasers in Dublin on the run. The Gardai wound up The Dublin Monaghan bombing enquiry – still the biggest single mass murder of the Troubles - very quickly. The Justice Minister, Paddy Cooney (who denied that the ‘Heavy Gang’ existed) and the rest of the Labour-Fine Gael cabinet did not protest. The incoming Fianna Fail government in 1977 sacked the Garda Commissioner, Ned Garvey, who had set up the ‘Heavy Gang’. They never said why. Fianna Fail and the mainstream media do not want to embarrass Fine Gael Labour too much on the issue today, as it also draws in British responsibility for acts of terrorism. It is important for all these forces to maintain a clear focus of pressure on Sinn Fein. The DUP and the unionist killers that Ian Paisley influences also want to maintain this agreed focus on Sinn Fein. The clear link between the DUP and unionist killers is revealed in The Sunday Tribune today. The story is not on the Sunday Tribune website – most peculiar, just like the (page 17) Irish Independent report of November 30th on British collusion with unionist killers is not on the Independent website (see link). 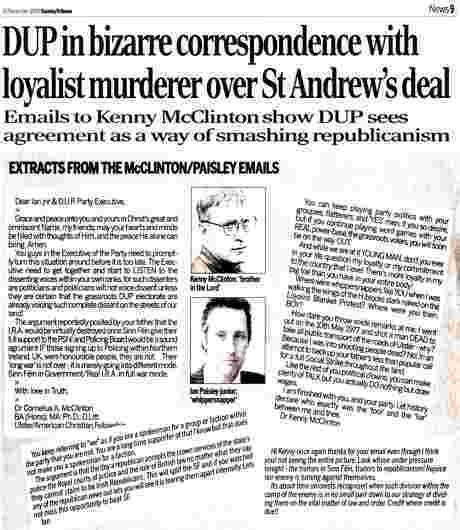 Ian Paisley Jnr and Jeffrey Donaldson are revealed as trying to persuade “loyalist double murder Pastor Kenny McClinton” (who Paisley calls a “long time supporter”) to keep the focus on trying to split Sinn Fein. At one point Donaldson, in warning against a “deeply green Plan B”, asks the loyalist killer: “Is this what you fought for, Kenny?”. The insane sectarianism that characterises unionist politics is revealed in this exchange, with unionist killing supporting unionist politicking - and vice versa. “Grace and peace unto you and yours in Christ’s great and omniscient name, my friends, may your hearts and minds be filled with thoughts of Him, and the peace He alone can bring. Amen. McClinton explains at one point how he ”shot a man DEAD” in support of Paisley’s 1977 loyalist strike. Mr Holier than though Donaldson, who has nothing to say about this sectarian killer’s killings, says in the body of the article that the release of the emails is ”unchristian” (possibly because the Bible did not reveal the big C as having ever sent or received any). While Paisley’s DUP put pressure on Sinn Fein to “support” the PSNI in order to try and split republicans, Bertie Ahern reinforces the DUP message today by demanding that Sinn Fein to call an Ard Fheis on policing before the British government have brought in the Patton reforms that destroy the Special Branch 'force within a force'. Fianna Fail do not care that they are in support of DUP bigots in making these calls on Sinn Fein. In 1976 the Labour-Fine Gael government were acting as loyalist appeasers. Is Fianna Fail playing the same role today? Has anything changed? In a taunt to Republicans, former SDLP leader Seamus Mallon called the Good Friday Agreement "Sunningdale for slow learners". Maybe he was right in ways he did not intend, since the SDLP and successive Irish governments have tried to blame republicans for the bringing down of the Sunningdale Power Sharing Agreement in 1974. The Dublin Monaghan bombings went off in the middle of the loyalist 'strike' and mass intimidation that brought down the Faulkner-Fitt executive. Maybe the SDLP and the Dublin government will learn that they are up against the same forces today as they were in 1974 - the combined weight of unionist sectarianism, the remnants of RUC Special Branch and elements of British intelligence. Maybe they are the “slow learners”. They should cop on and cop out of making demands of Sinn Fein on policing. is not the present coalition administration doing the exact same thing? 1. The repression (or7th extension) of the mc entee report on Dublin/Monaghan? 2. The Mc Kevitt case seems to be fraught with media and judicial spin. 3. The Donaldson case has left the media watchdog. 4.The collusion between SF and the Hain remit? the truth of what is happening and what has happened to the families. and how it will proceed into a globalised EU. Madam, - On RTÉ Radio's Morning Ireland on November 30th Sean Ardagh TD mentioned British refusal of co-operation as a reason for not holding a public enquiry into the "widespread collusion between British security forces and terrorists [ that] was behind many, if not all, of a number of atrocities on both sides of the Border that resulted in 18 deaths in the mid-1970s" (The Irish Times, November 30th). But an official tribunal might usefully also inquire into why the Garda and the Government were not "more vigorous in their attempts to identify and bring to justice the perpetrators". Fianna Fáil dismissed the then Garda Commissioner, Edmund Garvey, on its return to office in 1977. The reasons have never been properly explained. Some former members of the British security forces might cooperate with a public inquiry. Colin Wallace and Fred Holroyd have spoken freely about collusion. Holroyd met Commissioner Garvey in 1975, with other British forces personnel. John Weir, a former RUC-UVF member, also appears willing to talk. Retired RUC detective Johnston Brown, who wrote Into the Dark, detailing his own impeccable record in the RUC, might have relevant information to impart. Others with information are likely to appear once an official enquiry, with all the required safeguards, is set up. A precedent has been set with an enquiry into alleged Garda collusion in the killing of RUC officers. Why not one for Irish citizens killed as a result of alleged collusion by British military and police officers? The alternative offered is a Dáil debate. But those outside parliament with personal information would not be able to contribute. One might be forgiven for getting the impression that there is an attempt to limit inquiry.